Another year, another brazen campaign finance violation from the Left. Gretchen Whitmer, her campaign team, and her former chief of staff have engaged in a deliberate scheme to flout Michigan’s campaign finance laws. 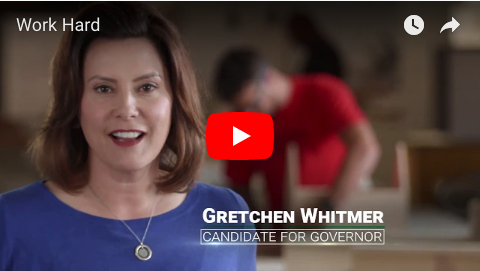 Whitmer appeared in ads produced by Build a Better Michigan, a political non-profit run by her former Senate chief of staff, that clearly identify her as a candidate for governor, a textbook example of illegally coordinated political activities. Worse, this $2 million ad-buy far exceeds Michigan’s $68,000 limit on in-kind contributions. The Left continues to act as if the law doesn’t apply to them. In 2009, Mark Schauer was hit with the largest fine in Michigan history at that time for his campaign finance violations. He went on to be the Democrat nominee for governor in 2014. That same year, his running mate Lisa Brown was investigated for violating campaign finance laws by refusing to file campaign finance paperwork. Despite an earlier complaint, Build a Better Michigan has made no effort to cease their $2 million ad-buy, or re-edit the 30-second ad to bring it into compliance with Michigan law. The Secretary of State should immediately investigate Gretchen Whitmer’s illegal coordination with Build a Better Michigan and put a stop to the Left’s disdain for the rule of law, once and for all.